The German-speaking Church has produced some of the glories of Catholicism (whether it be Haydn's Masses or amazing rococo churches like the Wieskirche), but this ain't one of them. The photo (which has appeared on Catholic Church Conservation and The Cafeteria is Closed) is taken from a ghastly First Holy Communion Mass in Catholic Austria. 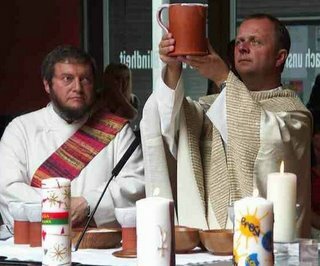 Much as I like the beer from those parts, I think I would have personally opted for a tulip-shaped chalice at Mass. Argh the liturgical "experts" of Linz at it again. As if the Missal of Paul VI isn't as bad enough, they go further to make it more Protestant. I hope God answers that diocese in the form of comet! How long O Lord? How long? One Catholic from Exeter College Oxford blogs another Catholic of the same. May St Ralph Sherwin,(also of the same College) pray for us! How can people join the Guild of Our Lady of Willesden? Floreat Exon! Good to hear from you. To join the Guild, write to Rick Miller, c/o Our Lady of Willesden, 1 Nicoll Rd, London NW10 9AX.